Roger Zuch. Photo by Lee Choo. When California State University, Northridge alumnus Roger Zuch ’73 (Journalism), ’75 (History) started reading Sherlock Holmes books, he was just a teenager with a thirst for the fictional detective’s crime-solving adventures. Forty years later, when he began to dabble in writing those stories himself, it was a momentous, creative jump that led Zuch into a second career — helping sustain the legend of Holmes, who has been referred to as “The Man Who Never Lived and Will Never Die” due to his enduring popularity. The famous fictional duo, private detective Sherlock Holmes along with his assistant and biographer Dr. John H. Watson, have created lasting ripples in the world of literature as they ingeniously solve mysteries — ones that are complex to the layman but are merely “elementary” to Holmes himself — through logic and deduction for different clients, including the London police in Scotland Yard. The project involves a single premise, proposed by a member of the online community. Other members may take that premise and start writing a larger story, contributing chapter by chapter. Zuch was hooked and decided to contribute. It was the first of many Holmes stories Zuch would eventually write. Under the pen name Roger Riccard, Zuch has written and published six books (so far) that continue the Holmes saga. 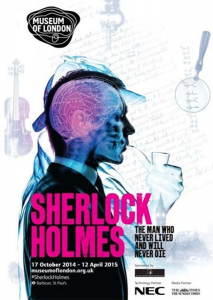 Remarkably, his second novel, “Sherlock Holmes and the Case of the Twain Papers,” was featured in The Museum of London’s “The Man Who Never Lived and Will Never Die” exhibit, which ran from October 2014 to April 2015. The exhibit explored the legendary, fictional detective’s evolution from Conan Doyle’s original book series (starting in 1887), to film and TV adaptations, including notable memorabilia such as Benedict Cumberbatch’s coat from the recent BBC series, “Sherlock.” Zuch’s novel was selected among other published literature that successfully showcased Holmes’ enduring legacy and popularity in modern literature. Zuch is currently working on the third book in a series entitled “A Sherlock Holmes Alphabet of Cases,” a collection of Holmes short stories with titles beginning with each letter of the alphabet. The second volume of the series was released in November 2018. When that series is completed, he will have over 40 Holmes stories to his credit. Just like Holmes’ adventures, Zuch’s journey to become an author came with many twists and turns. As an undergraduate at CSUN, then known as San Fernando Valley State College, he majored in journalism (and eventually completed a second Bachelor of Arts in history). Zuch joined the staff of the student newspaper The Daily Sundial, writing passionate sociopolitical commentary and drawing engaging editorial cartoons about the turbulent times of the early ’70s. Writing remained central to his career after college. Zuch taught high school creative writing at Village Christian School, where he also coached the varsity baseball team. Even in his later work in Human Resources, which he has been in for 35 years, and now as an HR manager at Information Technology Partners in Burbank, he uses his talents to write policies, procedures and newsletters, among other business literature. Newsletters and instruction manuals, however, weren’t nearly enough of an artistic outlet for the creative Zuch, who also occasionally dabbles in theater and sings with in the Crescenta Valley High School Alumni Chorale. “When you’ve got a creative heart, you’ve got to let it out some way,” Zuch said. So now, to “fill up that performance void,” he said, he writes stories about his favorite literary character. His excitement about the century-old novels was galvanized when American author Nicholas Meyer’s pastiche — writing in a style that emulates the work of another author or period — “The Seven Per-Cent Solution,” was released in 1974. Zuch called the novel “a new breath of life” for the Conan Doyle stories. “That encouraged me. Sherlock Holmes stories can be written now. I just kept an eye out for more and more as they came along,” Zuch said. The British TV series “Sherlock Holmes,” which ran from 1984 to 1994 and starred Jeremy Brett and Edward Hardwicke, also served as key inspiration for Zuch, who took special note of Hardwicke’s portrayal of Watson. A strong grasp on Watson’s character is important for Holmes pastiche writers like Zuch, who try to imitate Doyle’s creative style — that is, writing under the guise of Holmes’ prime confidant. Many of them, including Zuch, employ a literary device they call “The Great Game,” wherein they assume Watson and Holmes were real people, and that all their stories are actual unpublished manuscripts written by Watson himself. “I knew I had an idea for a full-on book, which was ‘Sherlock Holmes and the Poisoned Lilly,’” Zuch said. To take that idea from seed to shelf, he contacted the late Joel Senter, publisher of the E-Times, who shared a key contact in London. That contact was Antony Richards at Baker Street Studios, a Cambridge publishing house specializing in murder mysteries that since has published all of Zuch’s completed books. Richards also serves as one of Zuch’s consultants when it comes to historical accuracy. “If I have questions about something about Victorian times, I’ll check with Antony,” Zuch said. 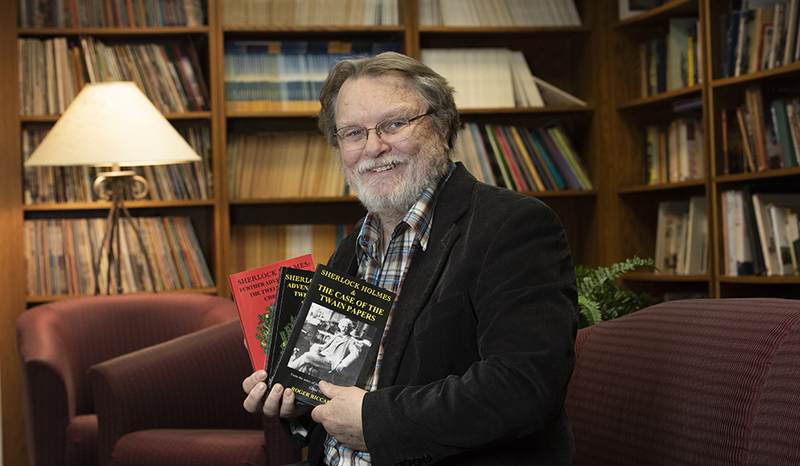 Zuch also has an invaluable resource in David Marcum, who has served as an editor for a number of Holmes anthologies, including “Sherlock Holmes: Adventures Beyond the Canon” and “The MX Books of New Sherlock Holmes Stories,” both of which include short stories by Zuch. The proceeds of these anthologies, as well as the writers’ royalties, are donated to Sir Arthur Conan Doyle’s former residence in Surrey, England, the Undershaw House, which today serves as a school for students with special needs. Zuch shared one example of the comedy that ensues when writers — and editors — strive for historical accuracy in Holmes tales. His first and best editor, however, is Zuch’s wife, Rosilyn, he said. She serves as first reader and editor on every one of his stories. Though both CSUN alumni who majored in Journalism, they missed each other by one year and the pair didn’t meet until 20 years later when Zuch joined a musical of which his eventual wife was the musical director. Rosilyn also inspired his pen name, Roger Riccard. “Riccard is actually my wife’s maiden name,” he said. In the future, while continuing his work in human resources by day, Zuch said he hopes to finish his ongoing “A Sherlock Holmes Alphabet of Cases” series in his free time — and perhaps a spin-off series of short stories and novels. “I’ve got an idea for another series. Same time period, a lot of the same characters, but with only occasional appearances by Holmes and Watson!” he said. Zuch advised students and other aspiring authors to remember the importance of a day job, no matter the field. “If you can find a job that you can earn a living at while keeping up your writing skills, consider yourself fortunate,” he said. He also noted that aspiring writers should not throw away unfinished or rejected manuscripts. Zuch’s works, under the pen name Roger Riccard, are available through Amazon and Barnes & Noble. His two-part short story anthology “Sherlock Holmes and the Twelve Days of Christmas” is available as an e-book from Endeavor Media, on Kindle.